At 8 AM, gather at the meeting point and transfer by coach to Prek K\’Dam on the Tonle Sap River. Enjoy snacks and cold drinks on the way with a brief stop at Kampong Thom, one of the first settlements in the pre-Angkorian period. Embarkation in Prek K\’Dam and welcome cocktail early afternoon. 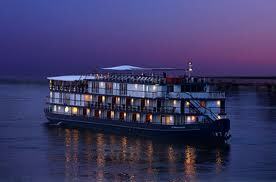 The Jayavarman sets sail upstream towards Kampong Chhnang and the great Tonle Sap Lake. We wind our way through the jungle and as the river narrows, it makes you feel at peace with yourself and the community. Later that evening meet your fellow passengers on board for Welcome Dinner on the Sun Deck. Before the sun rises, The Jayavarman sets sail to Kampong Chhnang via Prek K\’dam along the meandering Tonle Sap River, which narrows through leafy swaths of the South East Asian jungle. Take a walk through Kampong Louang, one of the last silversmith villages, to see the entire community involved in making various silver items to sell. Get back aboard The Jayavarman to eat lunch while cruising towards Kampong Chhnang. Wake up in the wee hours of the morning, truly energized to embark on a journey upriver to the pre-Angkorian temple of Wat Hanchey. Located at the top of a hill overlooking the river, it offers some of the best views in Cambodia. Dating from the 8th century, these ancient structures do justice to the architecture of the Chenla Empire which predated the glories of the mighty Angkor. Enjoy spectacular views of the surrounding well organized rice paddy plains, as well as a travelers blessing performed by the local monks. After lunch and a short cruise downstream we drop anchor at the shores of Kampong Cham. Visit Wat Nokor, a wat built within the ruins of an ancient temple that holds a timeless story. Then, travel to the Cheung Kok Ecotourism Village, a small village developed with support from Assistance Mediation Internationale (AMICA). Travelers can visit the village and take part in activities to experience village life. Profits from tourism go towards re-investment into long-term projects. Back on board The Jayavarman sets sail towards the capital Phnom Penh. Get up early in the morning to witness a truly indescribable scene while approaching Phnom Penh\’s river promenade. After breakfast, embark on a city tour in this dynamic, historical capital of Cambodia which has retained its French colonial charm. Sightseeing in the morning will include the dazzling white and gold architecture of the Royal Palace and the Silver Pagoda, outstanding displays of Khmer crafts at the National Museum and the temple of a hill – Wat Phnom. After lunch in a local restaurant, examine the painful, heart wrenching reminders of Cambodia\’s ugly past under the Khmer Rouge regime with an excursion to the Genocide museum to learn more about the Cambodian civil war. Introduction and onsite lecture by a local history professor. Thereafter, to ease the nerves a variety of cocktails will be at your disposal, followed by Cambodia\’s traditional and opulent Apsara dance performance. Experience the brilliance and richness of the culture, the soothing sounds of traditional music, the calming scent of incense stick and a delicious Khmer food buffet. Your journey with The Jayavarman has come to an end, but will not be forgotten. Disembark after breakfast and head into the city of Phnom Penh to further discover its culture and history.Day 1: Phnom Penh. Board The Jayavarman at 7:30am. Around 8:30am, embark on a city tour in this dynamic, historical capital of Cambodia, which has retained its French colonial charm. Sightseeing in the morning will include the dazzling white and gold architecture of the Royal Palace, outstanding displays of Khmer crafts at the National Museum and the temple on a hill – Wat Phnom. After lunch in a local restaurant, examine the painful, heart wrenching reminders of Cambodia\’s ugly past under the Khmer Rouge regime with an excursion to the Genocide museum to learn more about the Cambodian civil war. Introduction and onsite lecture by a local history professor.Thereafter, to ease the nerves a variety of cocktails will be at your disposal, followed by Cambodia\’s traditional Apsara dance performance. Experience the brilliance and richness of the culture, the soothing sounds of traditional music, the calming scent of incense sticks and a delicious Khmer food buffet. Welcome and farewell diner, mineral water, coffee and tea during breakfast.